Hello and welcome to the Ryzom Wiki! Would you like discover the world of Ryzom? So, walk through the domains that attract you proposed in Main portals of the Ryzom Wiki displayed below and often repeated in the site. You have some notes, stuffs to remem' ? For some years now, some homins had been wondering about strange anomalies encountered after the second Kitins Swarm. Their questions have become more and more numerous and pressing. But the homins weren't the only ones asking themselves questions, one day this dialogue was perceived... Read more. Writing Guide (only in French for the moment). Take your time, explore and bring your stone to the building ! The Encyclopatys is an independent associative project built by a team of volunteers around the universe of Atys (conceived by Nevrax for its online role-playing game the Saga of Ryzom) and designed to make it live and evolve. Whether you are an active player or not, an old role-playing veteran or an newbie, you can only read articles, comment, fix or take part in the project yourself right now ! Be Bold ! Did you notice, that we have moved and are now hosted at ryzom.com? 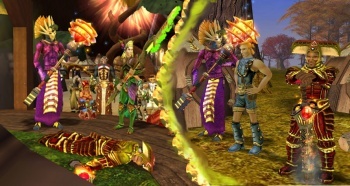 As announced we have merged the old official Lore Wiki with the community created Ryzom Wiki. For you that means that now there is only one wiki to find information on. That should make things easier and also concentrates man(and woman)power on one spot. Feel free to explore and also help expanding the wiki!